Hi guys! I hope your week is off to a great start. I'm just sitting here watching the Bachelorette which is a little boring this season. Are you watching? Are you finding a little lackluster so far? I mean, of course I'm going to keep watching, but I can still complain about it. I'm going to start the Zoya Summer Wanderlust collection tonight, and it features 12 polishes with shimmer and creme finishes. I'm delighted by the collage above...I'm loving the 4 shimmers in the collection. Shall we go ahead and take a little closer look at these warlocks? Up first we have Journey which is a summery strawberry shimmer. You guys know that I don't normally go for red polishes, but I am going to make an exception for Journey. This one is so hot! I think the only thing that would make this one better is if I had a little bit of a tan. I used 3 coats for all of the shimmers, but you very well may be able to get away with 2 coats. Macro photos and bright lights tend to bright out my visible nail line, which is why I used 3 thin coats. If you use thicker coats, or you have shorter nails, you will likely just need 2. Mandy has the same shimmer as Journey, but with more of a raspberry base. You can see a little bit of a purple flash in there as well. I didn't expect to like Journey a little bit more, but I do. This is 3 coats, but you may get away with 2. I wish I had more rivers near me with water this color! River is a bright cobalt blue shimmer that just pops. With the name, it reminds me of River Song from Doctor Who. The swatches above show three coats...I'm a broken record here. I can easily say that Scout is one of my top picks from the Wanderlust collection. It's so unique and murky that I couldn't resist this weird color for a summer set. It's a mossy chartreuse color with matching shimmer. It was opaque in 3 coats, but YMMV as stated above. What do you think so far? 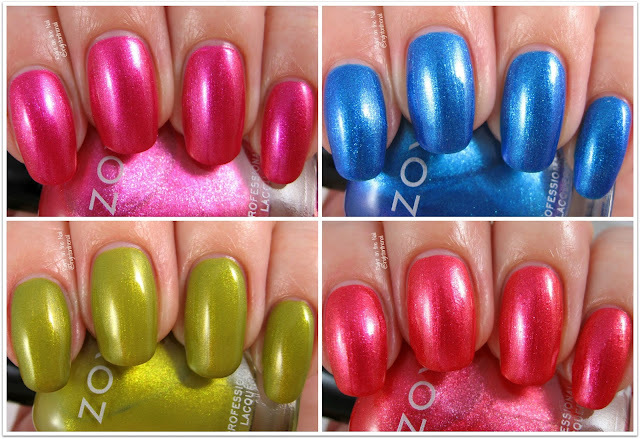 Zoya always knocks their summer collections out of the park, and I'm not disappointed. Come back later this week because I'll be finishing up the cremes for you. Zoya polishes retail for $10 and you can find out more about them on their website, Facebook, Twitter, or Instagram pages. Keep an eye out for them in your local Ulta store if you want to see the bottles in person before you buy. Oh yeah, and Zoya has a buy 3 get 3 free sale going on with the code 3COLOR (plus free shipping) through July 7, 2017.